Audacious 2.4.2 was released a while back and I got a lot of requests to upload it to the WebUpd8 PPA, but because of some changes in the latest Audacious I had to wait until the official Debian packaging was updated. So finally, Audacious 2.4.2 is now available in the WebUpd8 PPA. 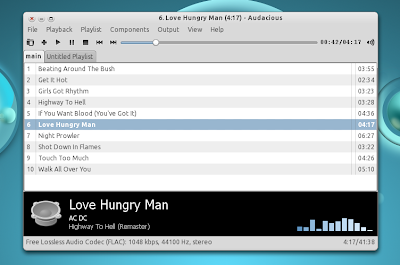 Audacious is a audio player that looks like Winamp 2.x, sharing some of its functionality too. 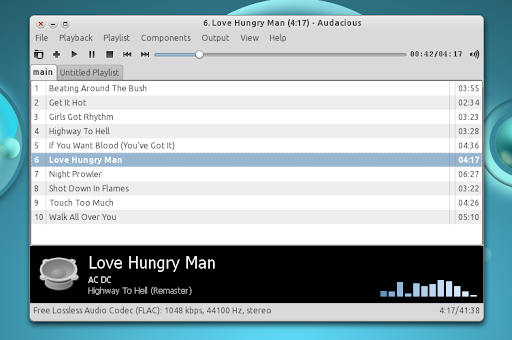 Starting with Audacious 2.4, the Winamp-like interface is not default anymore - Audacious now uses a clean and light GTK interface which will remind you of Deadbeef. The old Winamp interface is still available and can be enabled from the options. Audacious' strength consists in its huge plugin list: Audio Compression plugin (AudioCompressor AGC) to keep volume normalized at a specific level, Echo enhancing plugin, Crystallizer enhancing plugin, Voice Removal plugin, Sound stretching plugin, lots of visualisation plugins (Blur scope, Spectrum analyzer, RockLight and so on) and even a stream browser plugin which includes the most popular streaming directories. There's a huge list of plugins so install Audacious and try them for yourself. It seems the Audacious developers are not fans of changelogs so I couldn't find a list of what's new in the latest Audacious 2.4.2, but judging from the Mercurial log it seems the new version only comes with bug fixes.